On November 17, AERCO was visited by Ms. Arlette Soudan Nonault, Minister of Tourism and Leisure at the airport of Pointe-Noire to plan the installation of a tourist information office as it is at Brazzaville Maya-Maya airport since August 10 2016. Indeed, in the presence of Mr Clément Mouamba, Prime Minister, and other members of the Government, Ms. Arlette Soudan Nonault, Minister of Tourism and Leisure has inaugurated the first tourist information offices in the compound of Brazzaville Maya-Maya airport. In her address, she sincerely thanked AERCO’s teams for their collaboration in the achievement of this initiative. The development of Tourism is one of the areas of the country’s economy diversification. 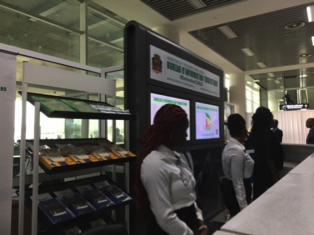 These information offices will now bridge a gap in placing Brazzaville Maya-Maya international airport in line with the standards of major airports and other reference tourism centres. In the medium term, Congo can become a very popular destination for tourists. Other offices will gradually be set up in the country. AERCO wishes the Minister a great success in this strategic direction.